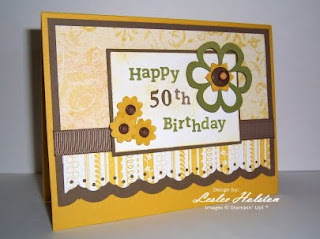 Leslee's Creative Inspiration: Happy 50th!! 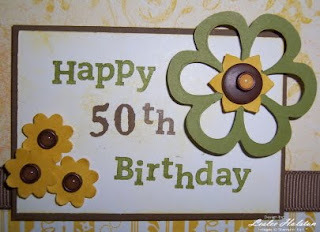 Tomorrow is my sister-in-law's 50th birthday! We are celebrating tonight with dinner at Red Lobster (her choice). My mother-in-law said we all need to make a big deal out of her birthday. You know, being the big 5-0 and all. Well, we'll see what we can do. For starters, here's the card I put together using Mercy's Tuesday Sketch Challenge #35. You can check the sketch out here, MTSC35, and play along while you're at it! Mercy has come up with some fabulous sketches and this one is no exception! I love this layout AND the way my card turned out too! Of course, I had to make mention of the "50th"...just in case she'd forget that detail! You know what they say, "the mind's the first thing to go"! I used the stamp-a-ma-jig to get perfect placement of the sentiment. I markered the 'Happy', 'th', and 'Birthday' from the Birthday Wish stamp. The "50" is from the retired Classic Alphabet Numbers set. 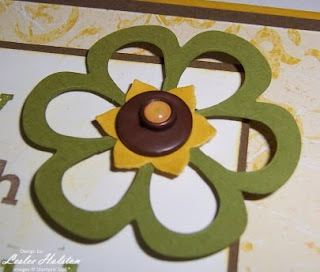 The sentiment is stamped in Old Olive and Soft Suede on Whisper White card stock. I then sponged on some Crushed Curry to give it an "aged" look...hehe (I crack myself up)! The large flower in Old Olive is die cut from the Baskets & Blossoms die and the Big Shot. It had been laying on my desk for months...so we can certainly call it 'aged to perfection'! Just seemed the perfect time to use it (finally). The Crushed Curry flowers are all punched from the Boho Blossoms punch. The button is 'vintage', one I pulled out of my personal stash. All the brads were from the local scrapbook store. 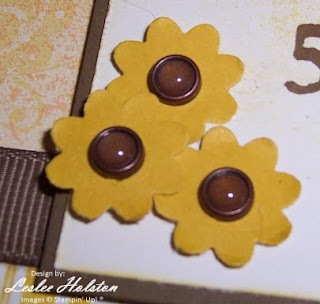 The Soft Suede card stock is scalloped using the corner rounder punch and layered with Razzleberry Lemonade DSP. I stamped the Whisper White strip with the striped stamp from the Razzle Dazzle set. It was another scrap that was laying on my desk, already eyelet border punched. I love when I can use up scraps!! My SIL is a scrappy kind of person so it is very fitting for her card. She recycles everything...matter of fact, she's queen of what we call "dumpster diving". I know, ewww! Anyway...I wrapped a length of Soft Suede Polka Dot ribbon between the DSP and eyelet bordered strip, using the un-dotted side. Mercy's sketch used what looked like stitching but I certainly don't stitch. I think the ribbon will suffice and don't think Mercy will mind...too much. I know my SIL will love her card! She'll never know it's a scrappy card and won't get the distressed aging and vintage button deal. But I know! And I'm getting a big chuckle out of this card!! I can laugh...she's got 10 years on me! Yet, I know those ten years will go by quickly. And she'll have her revenge somehow. Knowing her, she'll recycle this card and I'll get it back!! Thanks for stopping by today! Be sure to check out Mercy's sketch and her blog, Lord Have Mercy! It's super awesome! I hope you've been inspired to use some of those scraps laying at your finger tips! leslee...what a great birthday card! such fun and cheerful colors! thanks for playing along with this week's sketch again, and i hope to see you again next week too!